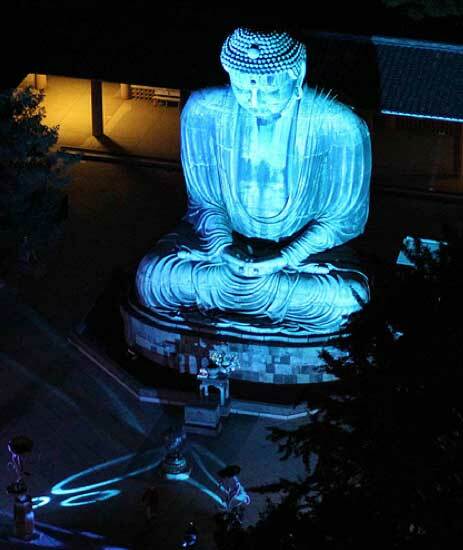 The Great Buddha in Kamakura, Kanagawa Prefecture, was illuminated with blue lights in commemoration of World Diabetes Day on Friday, Nov. 14. About 50 famous structures across Japan, including Tokyo Tower and Nagoya Castle, were illuminated in blue as part of the diabetes awareness campaign in over 90 countries and regions around the globe. Around 18.7 million people in Japan are estimated to be diabetic or in danger of developing the disease. We knew the Big Buddha wasn’t the only religious artifact in Kamakura (Japan), but we had no idea there were a full 170 (Buddhist) temples and 40 (Shinto) shrines scattered around the city. Of these, 119 are profiled in a new English book, “An English Guide to Kamakura’s Temples & Shrines,” written by two long-term local residents. 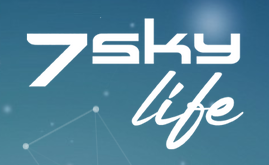 The meticulously researched work is divided into seven districts, each with a sample itinerary for the dedicated culture buff. The small, black-and-white photos aren’t much to look at, but then again, the book itself is small enough to fit in a large pocket and guide you to the actual sights. Other sections include a brief history of the area, sidebars on the finer points of temple-hopping like “omikuji” (fortune-predicting strips of paper) and ema (votive wooden tablets), plus write-ups on attractions like the “10 Famous Wells of Kamakura.” (Beau Miller/Metropolis). If you are interested to view a short film on the Daibutsu (the Great Buddha), the main spiritual and touristic site of Kamakura, you can watch my film on vimeo. I recently made a trip to Japan. It was not my first. The Japanese country, their people and their culture fascinate me for a long time. I had the chance to travel to Japan together with my spiritual teacher Sri Chinmoy several times and each journey was very special and very inspiring. When I had my first encounter with Japan in 1992 spiritual teacher Sri Chinmoy was planting a tree in the garden of the famous Daibutsu Buddha sculpture in Kamakura, not far from Toyko. Kamakura was the former capital of Japan and is full of buddhist temples and shrines. 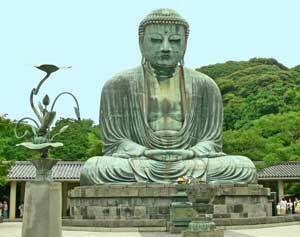 The big bronzen Daibutsu sculpture is more than 700 years old and is the most accurate embodiment of the great Buddha. For me personally it is a very familiar feeling to be near this monument. Perhaps I had some connection with Buddha in a previous incarnation. 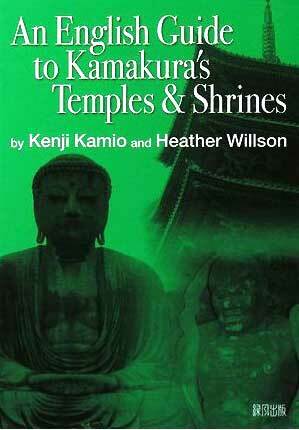 It was therefore with great pleasure that I returned to Kamakura in July of 2006 for a whole week. Three times I visited the immense Buddha, once to take some still shots, a second time to get some good video footage and a third time to assist and film a unique concert of Sri Chinmoy just in front of the sculpture. To have a great master of the past and a great master of the present in the form of Sri Chinmoy together was an experience I will never forget. Sri Chinmoy played several of his classical instruments as well as very modern ones like a Gong sampler, specially built by two of his German students. For me it’s always amazing to witness Maestro Sri Chinmoy improvising on the synthesizer, the piano or the pipe organ because the power and dynamism of the these performances cannot be compared with any other musician. I learned about the Kyudo archery from a friend of mine in Kamakura whose wife practices this martial art in the premises of one of the major Shrines in town. I was more than happy to assist two groups during their daily practice which impressed me a lot. The atmosphere in the training hall was a mixture of concentration and willingness with a devotional love for this artform, alive in Japan for more than 900 years. Although it was a “mere” training and not a performance, all students were in traditional costums, some of them worked on wood horses. In their quiver arows were ready to be used. In some cases the students had to aim their arrows while the “horse” was turned. Amazing was not only the perfefection of marksmanship, but also the sincerity of each movement. Another group was practicing in rows of four people aiming their arrows one by one, finishing by bowing down to a shrine. I had also the opportunity to film their Kyudo practice which is featured in a special episode of LIFE Voices, a monthly interview series, published on varous internet video sites. Another unforgettable experience was the discovery of the Kencho-ji Temple, the first of the five great Zen temples of Kamakura and the oldest Zen training monastery in Japan. It was constructed by order of the Emperor Gofukakusa during the regency of Hojo Tokiyori (1227-63). Work was completed in the fifth year of the Kencho Era (1253), from which the name of the temple is taken. I enjoyed every step in the buildings and gardens of this traditional holy place. I didn’t get the permission to film in the monastery, but I had the privilege to meet one young monk who told me some of the major principles of their life. I learned that a strict disciplined life incorporated an early meditation at 3 am, followed by a breakfast. Then the daily work in the garden or elswhere starts. Asked about their preferred diet, the monk answered that “if you lead a completely devoted life, there is no more desire or question on what to eat. You gladly accept what you get from the monastery”. For me this recent visit to Japan was again a milestone in the collection of memorable trips around the world, most of them I could do together with my master Sri Chinmoy. If you want to see more of my photos on Japan you can visit my album. The Great Buddha of Kamakura is a monumental outdoor bronze statue of Amida Buddha in the Kotoku-in Temple in Kamakura, Kanagawa Prefecture, Japan. It is believed that the statue was originally cast in 1252, following an idea by the priest Joko, who also collected donations to build it. The sculptors were One-Goroemon and Tanji-Hisatomo. The statue is approximately 13.35m tall and weighs approximately 93 tons. I had the chance to visit the site several times and was always fascinated by its magnitude; many say it is the most perfect image of the original Buddha. 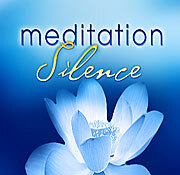 Watch this meditative video here on the blog or click on the vimeo logo to get the HD version. The soundtrack is by Parichayaka Hammerl.